Bundled up in insulated overalls and a winter jacket, Lucinda lifts the gallon size bucket. The water sloshes back and forth as she trudges across the yard, head bent down against the bitter cold and wind. The walls of the chicken coop provide little refuge from the cold as she pours water into containers for the chickens. WHAMP! The entire building shakes as the door to the coop slams shut, dropping the latch closed in the process. Lucinda tries to open the door and realizes she is trapped. Chicken coop doors latch from the outside, not the inside. Lucinda peers out the window toward her house. Andrew is inside watching the football game on TV. Surely he will realize she is gone longer than usual and come looking for her….or will he? It is a good game and he isn’t likely to leave his chair until it is over. This could be a long wait, the game isn’t due to end for over an hour. Thankful she had at least put on warm clothes, Lucinda contemplates her options as a captive in a chicken coop. There is the small hatch door that the chickens go in and out. 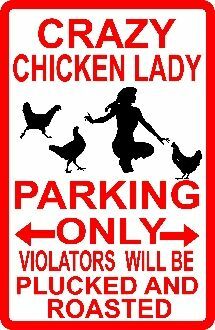 Maybe she could slip out of the coop that way. It could be kind of tricky. Should she go feet first or head first? Slide out on her stomach or on her back? So many decisions when planning an escape. Of course the size of the hatch could prove a challenge. What if she gets partway out and gets stuck? How long would she have to remain there, wedged half in/half out of the coop before Andrew discovered her? Would the two of them be able to free her? Would they have to call and wait for a rescue team? If a rescue team has to be called, would the local news pick it up on a scanner and arrive to capture the live story of the chicken coop captive. Good grief, would she ever live such a news story down? The stupidity of the human race is always great for human interest articles. Maybe the hatch escape idea isn’t such a great one after all. 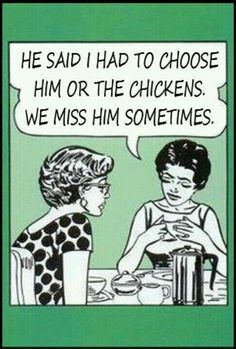 Maybe some good solid female bonding with a brood of chickens is the better option. WHAMP! A blast of arctic air somehow managed to dislodge the latch and blew the door back open. FREEDOM! Lucinda decided to make a break for it. After all, the opportunity might be short lived. The chickens were quite hospitable during her short visit, but the idea of an extended stay was not on her list of things to do on a Sunday afternoon. Closing the door firmly behind her as she enters the warmth of their home, Lucinda looks at her husband, still relaxing in front of the TV. Didn’t he realize she had been gone longer than normal? How long would he have waited before coming to check on her? Typical man, the brain goes to food and a growling stomach would have finally keyed him into the fact that his wife was missing in action. Better not go out to tend the chickens immediately after consuming a meal, the wait for a rescue could take hours! 1. Wear insulated outer wear to protect yourself from the elements. 2. Carry a cell phone to call for assistance as needed. 3. Go at a time when your husband may become hungry and realize you are missing. 4. Make sure you tell your friends and family about any mishaps so they can later share your story with others. This is based on a true story, names of the couple have been changed to protect their privacy.